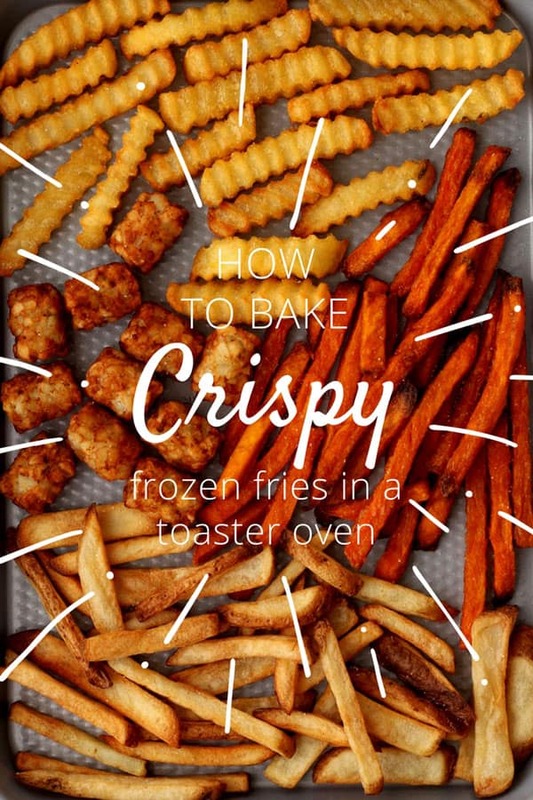 Learn the secret to baking crispy frozen fries and tots in your toaster oven. They make the perfect base for a batch of Loaded Fries For Two! If you’ve baked frozen fries in your toaster oven before you’ve probably ended up with sub-par spuds. Burnt edges. Soggy centers. 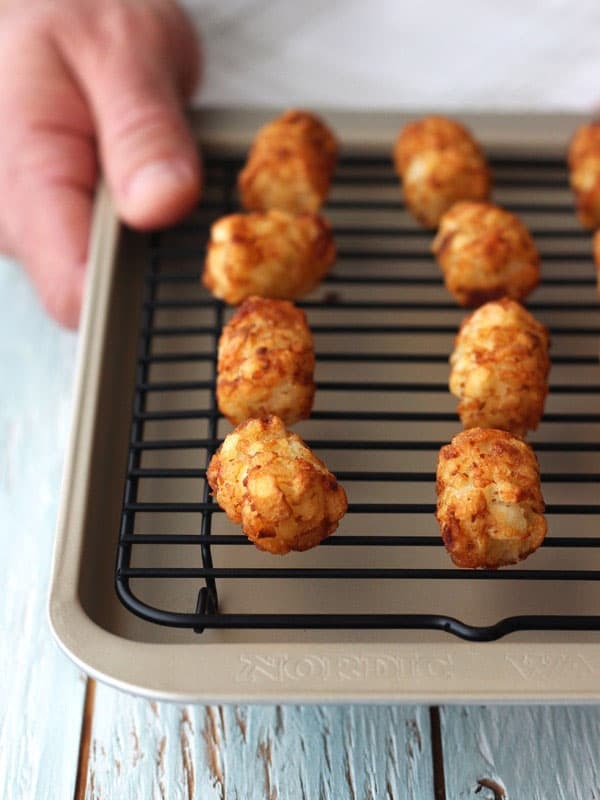 With these 3 toaster oven tips, you can turn any frozen spud from a soggy dud into an addictive crispy treat. The first tip immediately ups your crispy fry game. The second will put your toaster oven’s best feature to use. And the last one is something we never knew was possible with frozen fries. This revelation was inspired by the new Breville Smart Oven Air Toaster Oven. It’s like a regular toaster oven but on steroids. In addition to the usual toaster oven cooking functions, you can use it for air-frying. It comes with a nifty mesh basket that suspends the fries in the middle of the toaster oven. Then a super-convection fan circulates intensely heated air around them. Looking at the setup made me realize that even though our toaster oven doesn’t have a fancy basket, air-frying feature or super-convection fan we had still been baking our fries all wrong. They needed to be elevated. If you place frozen fries directly on the pan, the side facing the pan will release and trap moisture under the fries making them soggy. Just like with baked potatoes and baked sweet potatoes, using a rack allows a conventional toaster oven’s warm dry air to circulate around the fries. This helps to remove surface moisture and get the fries crispy. Extra bonus – because the frozen spuds are already coated in oil no additional oil is needed to prevent sticking. Not a single tot or fry stuck to any of our metal baking racks. Even better, you don’t have to flip your fries! This fun discovery was a total accident. While testing a batch we did something I’m sure you can relate to: setting the timer for the full cooking time instead of half to flip them. To our delight, the fully-cooked-but-never-flipped fries were perfectly browned and crisped on all sides. 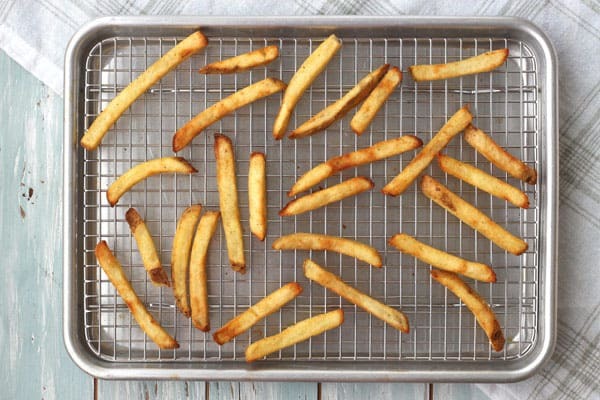 The mini baking sheet + rack combo in the Chicago Metallic Toaster Oven Bakeware Set (affiliate link) is great for making 1 or 2 servings of fries. Overall it’s a nice little set if you have a small toaster oven (though the muffin tin handles do make it too large for some little ovens). You can pick up the Chicago Metallic Toaster Oven Bakeware Set on Amazon. If your toaster oven is larger and can fit a 9×13 pan (w/o handles) you can go bigger. 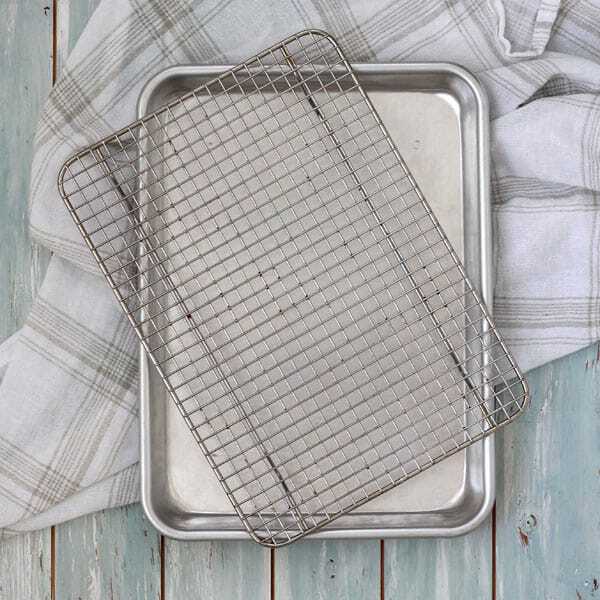 A small oven-safe baking rack and a Nordic Ware Quarter Sheet Pan is the perfect combo. You should be able to fit about 1/3 to 1/2 of a bag of frozen fries or tots on it. Baked fries won’t ever taste as good as fried but with your toaster oven’s convection fan they get pretty darn close. Crispy on the outside, tender and fluffy on the inside. Seriously, even the frozen sweet potato fries were crispy. Anyone who’s baked the moisture bombs that are sweet potato fries knows that getting them to crisp up is a near miracle. If this is your first time using your toaster oven’s convection fan know that it can require a few adjustments to the cooking time, temperature and maybe the rack placement too. Our countertop oven, the Breville Smart Oven Pro has three adjustable rack placements. I like to use the bottom placement for delicate convection baking (like lemon olive oil cupcakes) and the middle placement when we’re going for a crispier texture. 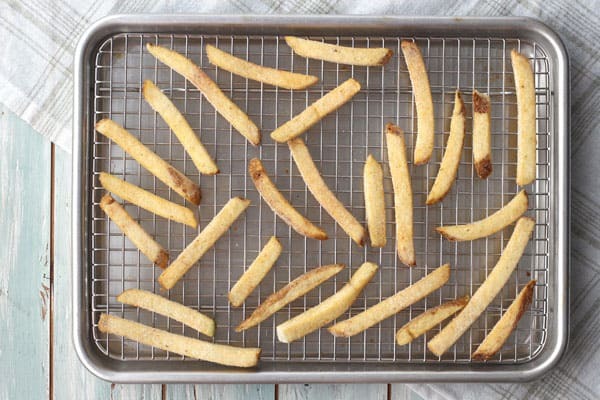 To find the right mix of cooking temperature and time with the convection fan on we baked a batch of straight cut frozen fries. • Reducing the instructed baking temperature from 425F to 400F. The directions said to cook the fries for 17 to 22 minutes. 13 minutes in we started checking for doneness. After 16 minutes the fries were cooked through and crispy. Cooking with your toaster oven’s convection fan may be faster or slower than ours. Always start with lowering the temperature 25 degrees and begin checking for doneness about 2/3 to 3/4 through the recommended cooking time. Adding more time until the fries are just how you like them. 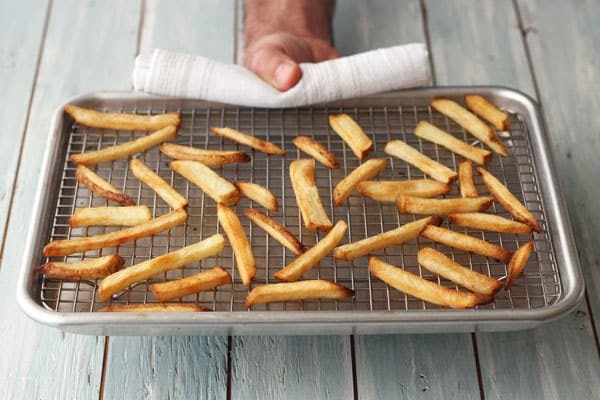 Do you season your fries before or after baking? 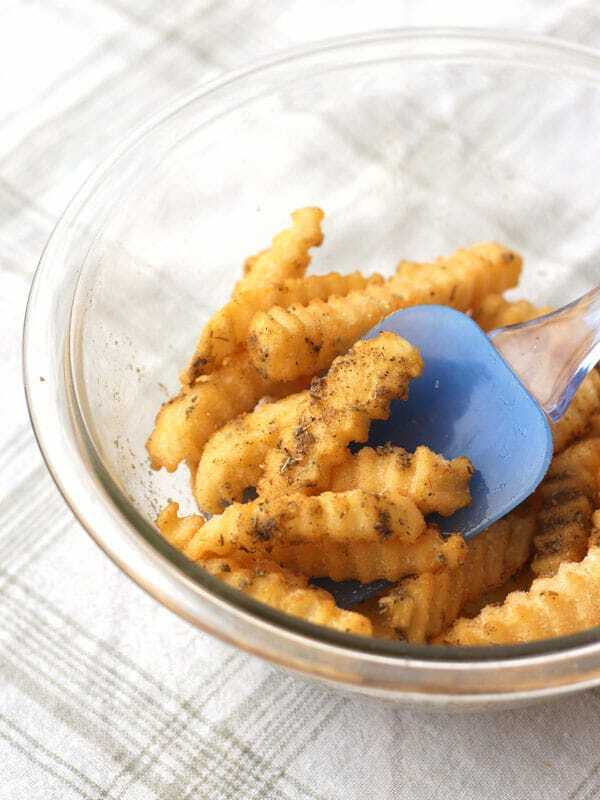 If you struggle with getting spices to stick to freshly baked fries try adding a little oil and your favorite spice blend before baking them. 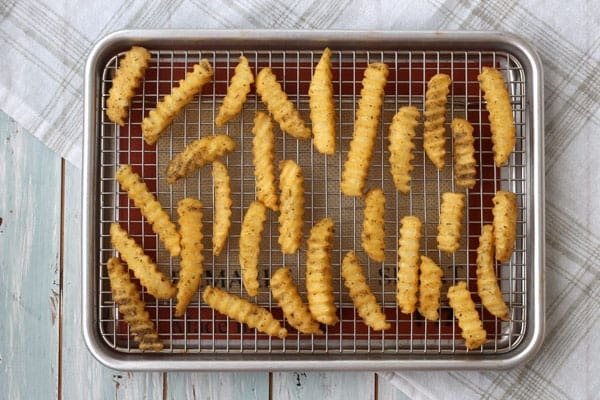 Place the frozen fries in a bowl and toss with 2-3 teaspoons of oil. You can also spray them with oil if you prefer that instead. Add seasonings and toss to coat. Place a baking rack on your sheet pan. Spread fries in an even layer on the rack and proceed with the package’s directions for cooking (with adjustments for convection if using). 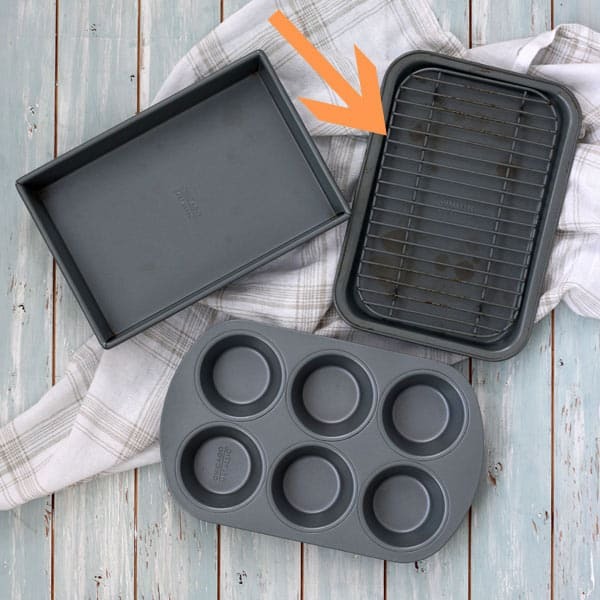 The first time we tried this, we weren’t sure if the oil and seasoning would drip into the bottom of the pan so we popped a toaster oven silicone baking mat under the rack. After cooking the fries the pan had a little of the seasoning on it but no oil. Can I line the pan with foil? Some toaster oven manufacturers recommend using foil. Others warn against it. We suggest you check your manual or contact the manufacturer for specific instructions on using foil in your little oven. 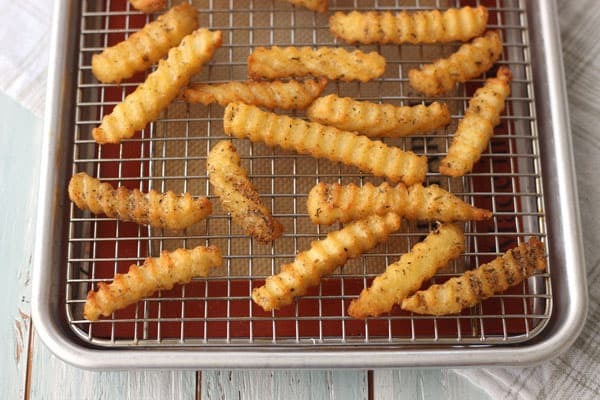 Not only can you season them before baking but you can turn your favorite frozen fries and tots into a restaurant-level treat that’s perfect for the grandkids next visit or a Netflix date night in. This article from Food Network has 50 different ideas to get you started. With directions for things like Indian Sweet Potato Fries, Beer-Cheese Fries and loaded Thanksgiving Fries we have a feeling you’ll find a few fun ideas. 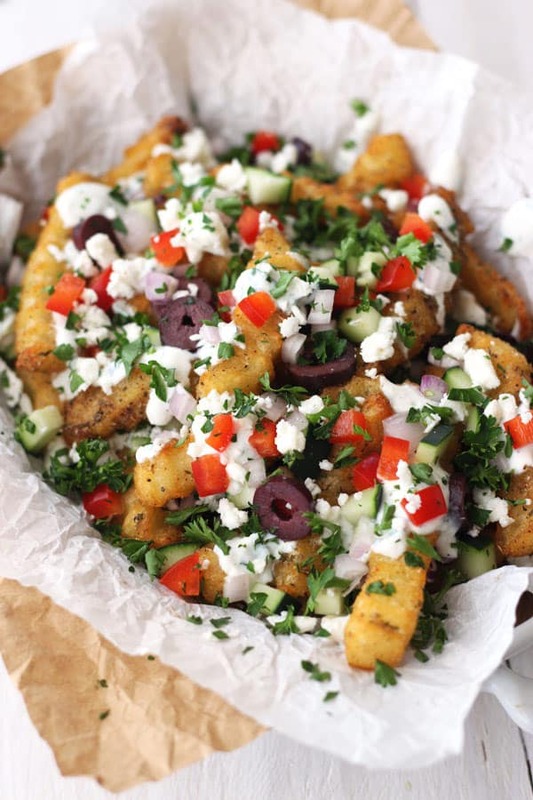 Inspired, we tried a version of their Greek Fries you can check it out here. Awesome post! 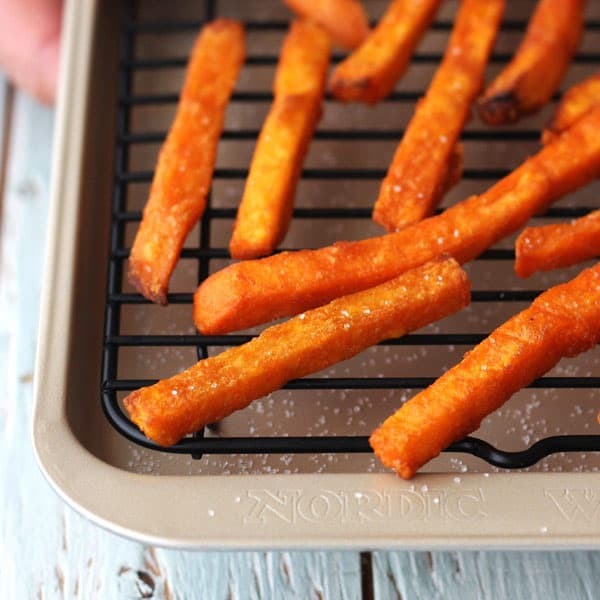 Do you have a particular spice mix that goes great with sweet potato fries? I find that just salt and pepper taste amazing, but I’m open to suggestions. Thanks, Richard 🙂 aren’t sweet potatoes just the bests! If you have a Trader Joe’s nearby any of their spice mixes would taste great, especially the Everything But The Bagel blend. Most days, my favorite seasoning is cinnamon, salt and a little chipotle powder but if you prefer a more savory flavor garlic powder with thyme or rosemary is nice too. there’s not much worse than limp fries! this is a very thorough post and i appreciate the tips!! Thank you for such an informative article and the recipe was an added bonus. Sounds like the oven you are using eliminates the air fryer and many other appliances!